Fader 1: blends the output of the two main resonators of the Modelonia engine. Fader 2: balances the cross-modulation between the resonators. The middle position of the faders set always the original preset values. The two faders can be MIDI controlled using MIDI CC 45 and 46. LFO 1 and LFO 2 rate controls. Octave transpose switch (one down). 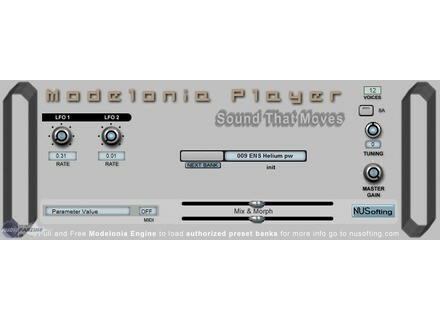 Modelonia Player is available now as a VST instrument plug-in for Windows. Activision DJ Hero Activision is set to release three new video game titles this fall, including DJ Hero. Loopmasters Dom Kane - Tech House Producer Loopmasters has released its new Tech House Producer title by Dom Kane.